MySingleFriend is a matchmaking site that not only allows you to write an online dating profile for yourself, but also write a profile for your single friend. It's open to people living in the United Kingdom, and currently has around 8,000 active members. MySingleFriend is a unique alternative to matchmaking websites. Nearly everyone has a single friend that seems too good of a person to go it alone. That's the idea behind MySingleFriend. It helps people find a common match for their single buddies. As well as creating a pleasant profile for a friend, you can use the search feature to find a number of local dating prospects. You can sign up free of charge but will need a membership upgrade for messaging. If your friend decides to decline the invitation to join, you can just sign up yourself instead. MySingleFriend helps people find a common match for their single buddies. 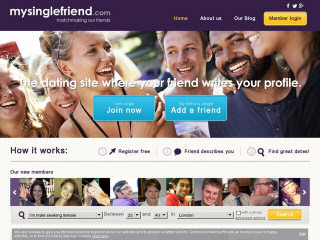 Mysinglefriend.com will only work for people living in the United Kingdom. Signing up a friend will require you to know the prospective member's email address in order to safely verify membership. Only upon accepting the invitation will the profile and any photos be approved by administrators and displayed on the website. Rss Feeds. Subscribe to comments for this site. [?] Receive updates about Mysinglefriend.com directly through your newsreader. this site i can see that it is the best but why i am from USA and i can't join the site so please let me join i like this site with all my heart. MySingleFriend 3.33 3 A review of MySingleFriend. MySingleFriend is a matchmaking site that not only allows you to write an online dating profile for yourself, but also write a profile for your single friend.